Müllerlight launches NEW Müllerlight Goodies - still an unbelievable 99 calories or less! Introducing new Müllerlight Goodies – the latest launch from the UK’s number 1 yogurt brand! Available From 8th March in three delectable flavour combinations, new Müllerlight Goodies is the first ever Müllerlight yogurt with a mix of delicious crunchy pieces on the side, bringing a whole new level of enjoyment, texture and taste to the sumptuous low-fat yogurt. And it’s even more irresistible as each variant of the indulgent, creamy-tasting and crunchy Müllerlight Goodies twin pot is an unbelievable 99 calories or less. The Müllerlight brand has already begun 2015 on a high, reaching the highest ever 4 weekly share of the Chilled Yogurt and Pot Desserts market of 9.4%, and highest ever retail sales value, selling £16.3m in the same period. Variants in the range are lemon yogurt with mini meringue style pieces, strawberry yogurt and white chocolate coated balls, and toffee flavour yogurt with chocolate coated balls for a satisfying crunch. 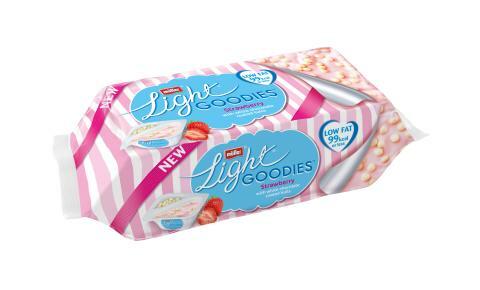 Müllerlight Goodies will be available in single flavour 4 packs with an RRP of £2.69 per pack.